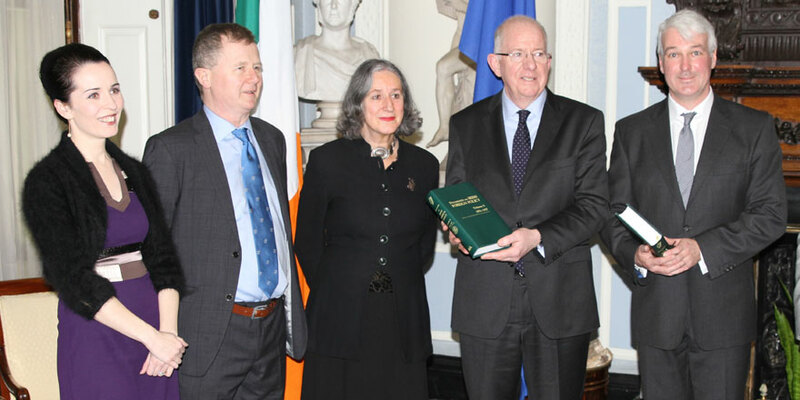 The tenth volume of Documents on Irish Foreign Policy (DIFP) was launched on 24 November 2016 at a capacity reception in Iveagh House by the Minister for Foreign Affairs and Trade, Charles Flanagan TD. DIFP X covers the years 1951 to 1957. It marks a major turning point in 20th century Irish foreign policy encompassing Ireland’s 1955 admission to the United Nations. This immense change to Irish foreign policy is the point from which Ireland’s global place amongst the nations in the 21st century originates. The volume covers the key themes of 1950s Irish foreign policy – UN membership, the renewed IRA campaign in Northern Ireland, the Suez Crisis, the Soviet Invasion of Hungary and the threat of a nuclear war. For the first time light is shed on the preparation of ‘the War Book’, the state manual through which Ireland would make its transition to World War Three. The high sensitive issue of the overseas adoption of Irish children is covered in detail, providing a documentary source like no other available into this difficult chapter of Irish history. The Department of Foreign Affairs has worked closely with the Royal Irish Academy on the Documents on Irish Foreign Policy project since its inception in 1997. The project is also supported by the National Archives. Nine previous volumes, covering the period from 1919 to 1951, have been published to date.